Ocean Weather Services - About Optimum Ship Routing The earliest form of ship routing may have been when early humans used the prevailing easterly winds to sail from island to island in the Pacific or when Arab traders sailed portions of the Indian Ocean based on the prevailing monsoons.By the time of Columbus, Portuguese sailors had taken advantage of their knowledge of the prevailing trade winds and helped Portugal become a powerful maritime power. When Columbus set forth on his voyage of discovery he used the prevailing trade winds to carry his fleet to the New World and then took the more northerly route for his return taking advantage of the prevailing westerly winds. Benjamin Franklin, in 1786 noted that “vessels were “sometimes retarded and sometimes forwarded in their voyages by currents at sea”. He knew that ships coming from Falmouth to New York took a fortnight longer than those coming from London to Rhode Island. Franklin consulted a Nantucket sea captain regarding this and was told that the cause was the Gulf Stream. (Nantucket captains knew of the Gulf Stream because of the whaling trade.) That same captain marked the stream on a chart along with directions for avoiding it. 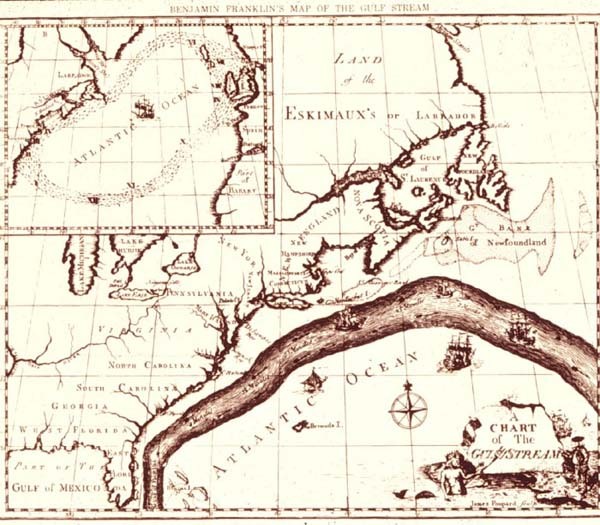 The Gulf Stream by Benjamin Franklin. Courtesy of NOAA Photo Library Modern ship routing ideas began during the early stages of WWII when the US Navy established the “Naval Meteorology and Oceanography Center” at the Naval Air Station in Norfolk. in 1958 “Optimum Track Ship Routing” (OTSR) was started to provide tailored safety and cost saving routing services to all ships utilized by the military for long duration open ocean voyages.Commercial marine weather routing had it start in the 1950’s when Howard Kaster, a meteorologist for United Airlines, started a company called “Pacific Weather Analysis Corporation” which later evolved into Ocean Routes in 1967 under Ray Maier and Bill Dupin.Other pioneers of commercial ship routing in the 1960’s included Bill Kaciak the founder of “Weather Routing Inc.”, TV weather man Louis Allen who started “Allen Weather Corp” and “Bendix Marine Science Services” under Robert A Raguso which began routing operations in 1968. What is Optimum Ship Routing?Optimum ship routing is the art and science of developing the “best route” for a ship based on the existing weather forecasts, ship characteristics, and special cargo requirements. For most transits this will mean the minimum transit time that avoids significant risk to the vessel, crew and cargo. The goal is not to avoid all adverse weather but to find the best balance to minimize time of transit and fuel consumption without placing the vessel at risk to weather damage or crew injury.Route planning normally will start be reviewing the appropriate Pilot Chart Atlases and Sailing Directions (Planning Guides) to determine the normal weather patterns, weather risks and prevailing ocean currents. The Routing Service then reviews recent weather patterns and weather forecast charts to determine the most likely conditions during the course to the voyage. A preliminary routing message is transmitted to the master of a vessel prior to departure with a detailed forecast of expected storm tracks, an initial route proposal with reasoning behind the recommendation and also the expected weather conditions to be encountered along that route. This allows the master to better plan his route and offers an opportunity to communicate with the service any special concerns that he or she might have due to special cargo requirements or ship condition. Once the vessel departs, the vessel’s progress is monitored closely with weather and route updates sent as needed. The earliest form of ship routing may have been when early humans used the prevailing easterly winds to sail from island to island in the Pacific or when Arab traders sailed portions of the Indian Ocean based on the prevailing monsoons. By the time of Columbus, Portuguese sailors had taken advantage of their knowledge of the prevailing trade winds and helped Portugal become a powerful maritime power. When Columbus set forth on his voyage of discovery he used the prevailing trade winds to carry his fleet to the New World and then took the more northerly route for his return taking advantage of the prevailing westerly winds. Benjamin Franklin, in 1786 noted that “vessels were “sometimes retarded and sometimes forwarded in their voyages by currents at sea”. He knew that ships coming from Falmouth to New York took a fortnight longer than those coming from London to Rhode Island. Franklin consulted a Nantucket sea captain regarding this and was told that the cause was the Gulf Stream. (Nantucket captains knew of the Gulf Stream because of the whaling trade.) That same captain marked the stream on a chart along with directions for avoiding it. Modern ship routing ideas began during the early stages of WWII when the US Navy established the “Naval Meteorology and Oceanography Center” at the Naval Air Station in Norfolk. in 1958 “Optimum Track Ship Routing” (OTSR) was started to provide tailored safety and cost saving routing services to all ships utilized by the military for long duration open ocean voyages. Commercial marine weather routing had it start in the 1950’s when Howard Kaster, a meteorologist for United Airlines, started a company called “Pacific Weather Analysis Corporation” which later evolved into Ocean Routes in 1967 under Ray Maier and Bill Dupin. Other pioneers of commercial ship routing in the 1960’s included Bill Kaciak the founder of “Weather Routing Inc.”, TV weather man Louis Allen who started “Allen Weather Corp” and “Bendix Marine Science Services” under Robert A Raguso which began routing operations in 1968. What is Optimum Ship Routing? Optimum ship routing is the art and science of developing the “best route” for a ship based on the existing weather forecasts, ship characteristics, and special cargo requirements. For most transits this will mean the minimum transit time that avoids significant risk to the vessel, crew and cargo. The goal is not to avoid all adverse weather but to find the best balance to minimize time of transit and fuel consumption without placing the vessel at risk to weather damage or crew injury. Route planning normally will start be reviewing the appropriate Pilot Chart Atlases and Sailing Directions (Planning Guides) to determine the normal weather patterns, weather risks and prevailing ocean currents. The Routing Service then reviews recent weather patterns and weather forecast charts to determine the most likely conditions during the course to the voyage. A preliminary routing message is transmitted to the master of a vessel prior to departure with a detailed forecast of expected storm tracks, an initial route proposal with reasoning behind the recommendation and also the expected weather conditions to be encountered along that route. This allows the master to better plan his route and offers an opportunity to communicate with the service any special concerns that he or she might have due to special cargo requirements or ship condition. Once the vessel departs, the vessel’s progress is monitored closely with weather and route updates sent as needed.